Artbook: The Art of Forgotton Anne: Delve into the gorgeous art of Forgotton Anne. This digital artbook contains over 90 pages of art from the game and the development process including early sketches, storyboards, and much more. Forgotton Anne Early Prototype: Run and jump your way through early iterations of locations in the game and discover the development process with developer notes scattered throughout. Anne's Theme music sheet: Get your hands on a “forgotten scroll” containing the musical notation for an original beautiful piano arrangement of Anne’s Theme. Collection of Anne's gameplay Sprite Sheets: Study Anne's movements with this collection of Anne's ingame animation frames. Contains 10 sprite-sheets in high resolution. 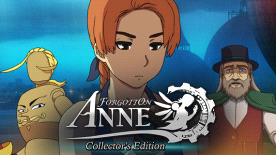 Forgotton Anne Orchestral Soundtrack: Relive the memories of Forgotton Anne with this special soundtrack recorded with the Copenhagen Philharmonic Orchestra. Includes the theme song 'Forgotten Anne' by Randi Laubek.